I’m totally mesmerized watching teen aged girls these days. It won’t be long before P is there and I’m curious and scared for what is coming down the pipe. I’m also wondering who will P be? What kind of girl will she be? What will her style be like? Who will her friends be? Last week we were in the waiting room in P’s dentist’s office. It seemed like all the patients that day were teenage girls and they were there with their moms. I looked around and noticed all the girls were pretty much a younger version of their mothers. They almost even dressed the same. I’ve noticed this almost everywhere I go: church, friend’s play date and parties. As mothers we are the main role model for our daughters. 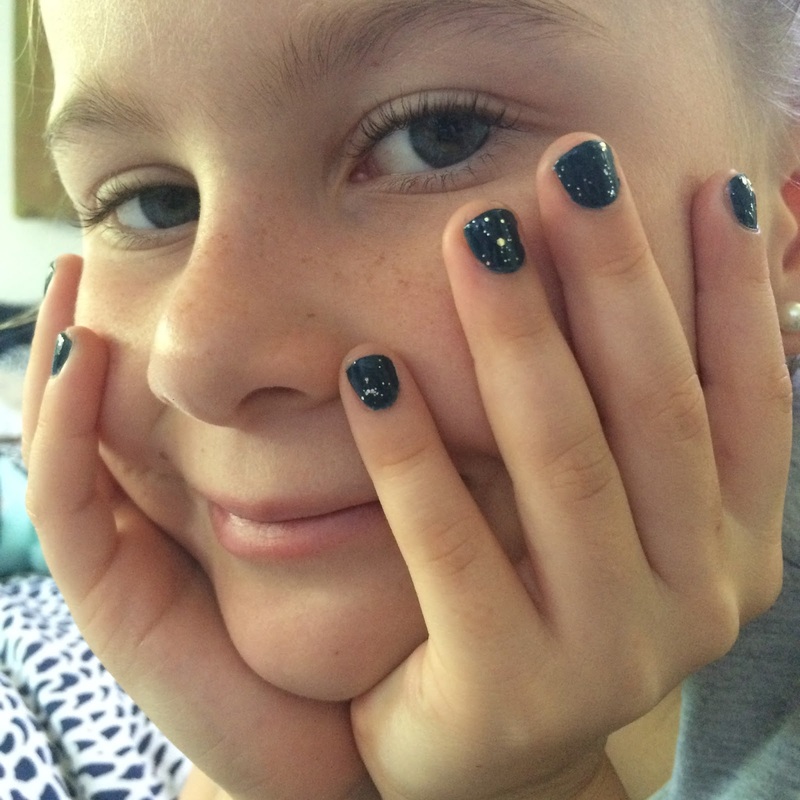 And that’s when I changed my mind about not letting P wear nail polish until she is 16. I wouldn’t say I’m unstylish. In fact, I know I can put an outfit together when need be. For an event I can look very good. However, on a day to day basis I’m more of a mess than polished. In fact, this week as I clean out college and high school pictures I noticed my hair was always messy. My look was very casual. Too casual. My mom was definitely a hippie. I followed suit to a big extent. That’s not what I want for my girls. To me the ideal woman is one who can be casual and dressed up. She can look good in make up and without. Whether she’s going for a run or to a black tie event she looks good, great even. Her hands look manicured even without polish. I guess ideally, I’d like my girls to be a better, more polished version of me. I didn’t start wearing makeup regularly until I became a mom. My girls are blonde/light hair with blue eyes. With my dark hair I was constantly mistaken for their nanny. In an effort to rectify that I started wearing make up and not wearing sweats. It was such an effort. Too much of an effort at times. Now P is older and I put myself together for her behalf really. I don’t want her to be embarrassed of her mother when I go to pick her up from school or when we bump into her friends. But I wish I could take it up a level. Unfortunately, I’ve been too much of a tomboy for so long. And so, in an effort to support my girls’ “girlieness” (each is more girlie than the next) I’ve decided I’m going to let them paint their nails. I wasn’t allowed to wear any kind of make up until I was 16. I liked that rule because as I’ve said to my chiquitas “If you want people’s attention you first must learn to do it with your own personality and accomplishments. When you’ve learned that skill set then you earn the right to use all the colors of the rainbow.” I’ve liked the rule in the past. Now I don’t like the all or nothingness of it. I think allowing them to play in stages might be better: first nail polish, later pink lip gloss, then mascara, eye brow highlighter and eye highlights until they can start using more and continue to use it all appropriately for the right time and place. If I want women who are a bit more aware of their presence and appropriate appearance I must allow them to develop that part of themselves and to be comfortable with it. I must give them the freedom to play with their looks and to enjoy this process of becoming a woman. As women we go through such drastic changes with our bodies growing up. Going from nothing to all make up seems like another drastic change at a very awkward and ever-changing time in their lives. When I had my own company one of the lessons I learned was that nothing works in absolutes. In business you must always be analyzing and ready to make adjustments and changes to better your company’s position. I think I’m using that same advice for parenting. I’ve analyzed who I am, where I wish my daughters to be and making adjustments to my rules to better their future positions. And in any case, I’m a woman. I’m allowed to change my mind. Previous Previous post: Today was HUGE!